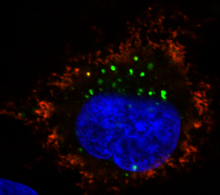 Using fluorescent antibodies, scientists can detect when cells are responding to an orphan receptor's ligand, because the receptors get taken into the cell and turn from red to green. Courtesy of Rebecca Meyer. Researchers at Emory University have identified a protein that stimulates a pair of "orphan receptors" found in the brain, solving a long-standing biological puzzle and possibly leading to future treatments for neurological diseases. The results are published this week in the Proceedings of the National Academy of Sciences, Early Edition. The human genome is littered with orphans: proteins that look like they will bind and respond to a hormone or a brain chemical, based on the similarity of their sequences to other proteins. However, scientists haven't figured out what each orphan's partner chemical is yet. Orphans that look like GPCRs (G protein-coupled receptors) currently number about 100. GPCRs are the targets of many drugs and are involved in vision, smell and brain cells' responses to a host of hormones and neurotransmitters. One orphan GPCR, called GPR37, has attracted interest from researchers because it is connected with an inherited form of Parkinson's disease. It is abundant in the dopamine-producing neurons that degenerate in Parkinson's. But the identity of its partner chemical, or "ligand," was unclear. "We reasoned that GPR37 had to be doing something important, besides becoming misfolded in some forms of Parkinson's," says senior author Randy Hall, PhD, professor of pharmacology at Emory University School of Medicine. Working with Hall, graduate student Rebecca Meyer devised a way to detect when cells producing GPR37 were reacting with GPR37's ligand. "Usually, cells remove GPCRs from their surfaces when they encounter their ligand," Meyer says. "So we set things up so that GPR37 would be labeled red on the surface of the cell, but would appear green once internalized." They discovered that cells producing GPR37 – and also a close relative, GPR37L1 -- respond to a protein known as prosaposin, which was discovered by John O'Brien of University of California San Diego in the 1990s. Prosaposin is a growth factor for brain cells and protects them from stress. Scientists studying it had worked out that it stimulates cells via a GPCR – but which one was unclear until now. In animal models, prosaposin has shown potential for treating conditions such as stroke, Parkinson's and neuropathic pain. An artificial fragment of prosaposin called prosaptide has been tested in clinical studies, but it quickly breaks down in the body. "That's the reason why it was so important to find the receptor," Hall says. "Then we can actually do some pharmacology." Now, Hall's laboratory is planning to look for other compounds that can activate GPR37 as well. These could be more stable in the body than the previously studied protein fragment and thus better potential drugs. Doctors have reported a few cases of genetic deficiency in prosaposin, leading to severe neurodegeneration. Mice engineered to lack GPR37 have more subtle brain perturbations, so Hall also plans to test the hypothesis that prosaposin acts by both GPR37 and GPR37L1, by "knocking out" both genes in mice, potentially duplicating the same severe effects seen in the human cases of prosaposin deficiency. Meyer is a student in Emory's Neuroscience graduate program. The research was supported by the National Institute for Neurological Disorders and Stroke (R21-NS081461) and the National Institute of Environmental Health Sciences (P01-ES016731). Reference: R.C. Meyer, M.M. Giddens, S.A. Schaefer and R.A. Hall. GPR37 and GPR37L1 are receptors for the neuroprotective and glioprotective factors prosaptide and prosaposin. PNAS Early Edition (2013).